Spend another £81.54 to get FREE DELIVERY! DX100T 4" 100mm extractor fan with a built in over-run timer to continue the extraction of moisture and odours after the unit is switched off. 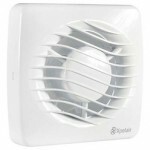 Users can adjust the DX100T timer fan to their preference at installation from 2 to 20 minutes. Use with an external switch or sensor. Supplied with a universal fixing fit containing wall tube, 2 x gasket, outer grille and skirt moulding for window and wall installations. All DX100 extractor fans (except the CP clamp packed model) come complete with a universal mounting kit comprising of a wall tube, gasket x2, outer grille and skirt moulding for window mounting in single glazing up to 6mm. Also suitable for wall or ceiling mounting. DX100 models also include an air operated backdraught shutter, outer grille and ducting.